Reprint. TV tie-in. 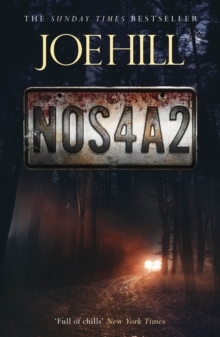 Originally published: as NOS4R2. 2013. COMING 2019 - BRAND NEW SERIES on AMC - The channel that brought you THE WALKING DEADSummer. Massachusetts. An old Silver Wraith with a frightening history. A story about one serial killer and his lingering, unfinished business. Anyone could be next. We're going to Christmasland ... NOS4R2 is an old-fashioned horror novel in the best sense. Claustrophobic, gripping and terrifying, this is a story that will have you on the edge of the seat while you read, and leaving the lights on while you sleep. With the horrific tale of Charles Manx and his Silver Wraith, Joe Hill has established himself as the premiere horror and supernatural thriller writer of his generation.